Combine all liquid ingredients in a saucepan, add grated ginger and pressed garlic. Mix and bring to a boil, simmer until thick. Mix and bring to a boil, simmer until thick. Season the fish …... Add the fish fillet and coat well. 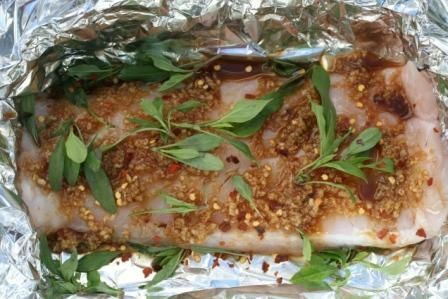 Wrap the fish individually using baking paper, foil or banana leaf. Make sure it is really well sealed into a lovely neat little pocket. Lay the fish back flat and add the green onions on top of the surface. Finally, drizzle soy sauce evenly across the top of the fish. Place in the oven and cook for 25-30 minutes or until done. Spoon this mixture over the fish and bake for another 5 minutes or until fish is just cooked through. You can use 2 800gram fish if you prefer, but cut the cooking time to 15 minutes. 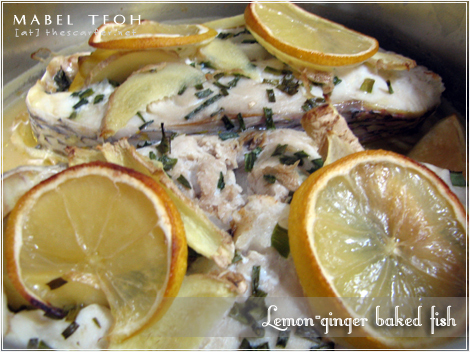 The fish can be rubbed with the ginger mixture up to 6 hours ahead, but only bake just before serving.